This is one of the few Cantonese restaurants left in Hong Kong that preserves the traditional appearance, operation, and most importantly the taste of the food especially when it comes to dim sum. If you want to experience the dim sum 點心 experience of what once upon a time ubiquitous Cantonese tea restaurant 茶樓 during the colonial era Lin Heung Lau 蓮香樓 and the nearby Luk Yu Tea Room 陸羽茶室 are about it. The very well appointed Luk Yu Tea Room 陸羽茶室 however has always been a very exclusive establishment catered to the well heeled businessmen in the Central District. Lin Heung Lau 蓮香樓 on the other hand are for the everyday people. In a recent trip to Hong Kong I wanted to visit some dai pai dong 大牌檔 that are not in the tourist beaten paths. I seek out a small cluster in Sham Shui Po. While dai pai dongs used to be ubiquitous in Hong Kong decades ago now there are only few remaining. There is a resurgence of dai pai dongs in recent years due to the rekindled interest of the local people and tourists. These new dai pai has improved sanitation and are constructed with revised modern design and material like stainless steel. I am not too crazy about entree that is served cold. May be is just I am aware that our taste receptors don't work as well in cold. Case in point, you have to add much more sugar in a cold drink such as ice coffee to taste the same sweetness than if you drink the same coffee hot. Likewise in Northern China there are appetizers that are served cold. To make them tasty the flavor and seasoning have to be more concentrated than if you serve them hot. I have 2 groves of banana plants in my property. When I first bought the house I was so surprised to see a grove of banana plant in the backyard. I had no idea that it is possible for banana plant to survive in mild Pacific Northwest. In the first winter everything above wilted from winter freeze. The blustery weather in late fall also tends to batter the leaves. I would learn that despite how sad the plants look, new shoots would spout each spring, and the new growths of the year would reach great height by the end of the summer. I took some small shoots together with enough rhizome and planted a grove in the front yard. I get a lot of surprised remarks from passerbys and neighbours alike. A few weeks ago I gave away a few shoots to a passerby so he and his wife too can have banana plants in their yard. They were very happy. I have been considering buying a cover for Brunnhilde ever since summer. The thought of manhandling such a large cover on the 11 feet high vehicle have been the cause of my indecision. From my research the class B RV cover sold on eBay by elitecarcovers that claims to fit Airstream Westfalia looks most promising. Reading between the lines I suspected it is a generic class B RV cover. It was $225.52 with $20 shipping. Seeing the vendor's name I thought I would see if it has a website outside of eBay. Sure enough it does. Trouble is they only have one type of class B RV cover, and there is no mention it is the same one sold on eBay. There are 4 sizes with identical width, height, but different length. I suspected that the shortest one must be the same one on eBay. It is $20 cheaper and with free shipping - a net $40 saving it is the same cover. Months passed and now it is rainy seasons here. I decided to give them a call. A Hispanic sounding lady answered the call and I immediately cut to the chase on my question. She acknowledged it is the same cover. I expressed some reservation on it fitting the 11 feet tall camper. She checked her purchase history of the Airstream Westfalia and said she did not see any reported problem. Knowing with only 250 in the US I would be wasting my time expecting they have actually outfitted one on it. While the cover's 117" height is much shy of 132" actual height of the vehicle I was counting the camper's narrower width than the cover's 84" width would allow the cover to drape down a few more inches to make up on the apparent dimension deficit. The other main concern is the protruded bump of the high top front. However I figure the 20 feet length of the cover for the actual 18.5 feet vehicle length would give extra slop to accommodate the bump. I ordered the cover online. This is a very common and popular dish in a restaurant that serves Cantonese cuisine in Hong Kong. In the old days in these restaurant there is only a few dishes of fried rice. This minced beef fried rice 生炒牛肉飯 and Yangzhou fried rice 楊州炒飯 are always on the menu. Sticky rice cake is eaten in many Asian cultures. It is called lian gao (or lin go in Cantonese) 年糕 in Mandarin. It is made with flour of glutenous rice (sticky rice). Here in Oregon I found the best quality ones are from Korean stores. While they are exactly like the Chinese one, the Korean ones always have a slanted cut instead of straight cut. I had long wanted to learn to make paella. Watching how it is made in travel shows intimidated me as they always show you some Spanish chefs prepared it in an open fire with only twigs as fuel. Also I discovered that an online purveyor of Spanish food is more than happy to sell you everything you would need to make paella. Like many cooking it is best to just do it and learn from your mistake. I decided to plunge in with both feet. Paella is remarkably similar to Chinese clay pot rice though the ingredients and technique in preparing them are different. One of my passion on food is to recreate a number of memorable street snacks I loved in my youth, or those I encountered during my overseas travel. Taro is eaten in most if not all Asian cultures. Taro 芋頭 comes in different sizes from tiny ones smaller than chicken egg to big ones weighting in a few pounds. They are not always good to eat and picking the delicious one may be a challenge. The good eating one should not be too powdery that tastes dry. It should have some glue like consistency but yet a bit powdery. One of my recent passion in cooking of Chinese cuisine is to visit dishes that have very little exposure outside of Asia. Many of these are popular regional dishes ate by families at home. While you may find them in some restaurants they are more like home cooking. 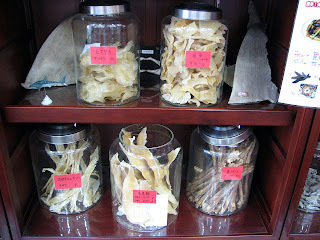 Recently I was shopping at my Asian seafood store. The shop lady has this salted vegetable that caught my eye each time I shop there. Problem is each package are bigger than I want to keep at home. It is a preserved root vegetable called dai tao choy 大頭菜 - translates as big head vegetable. It is really just a kind of big turnip called kohlrabi preserved in a lot of salt. The thought of using it to make a very savory dish nudged me to buy a 2.25 lb package. I at times see this fish and for the longest time curious how it taste. I think it is a small monkfish. The Asian grocery stores rarely have them. They are fresh but not live. I decide to give one a try. I have been wanting an upright coatrack a very long time. To my amazement it is impossible to find an acceptable one that looks good and functional here in the US. I decided to make my own. I want one that can hold many jackets or coats. It must be stable. I set out to design a simple one that has the form follows function attributes. I have been digging my food photographs. I found these from 2 years ago making takoyaki たこ焼きfor the first time. It all started from my shopping at the local Korean supermarket H-Mart. I came across this very inexpensive cast iron takoyaki mold. I snapped it up, and bought the needed ingredients to give it a try. I almost forget there is a package of Belgian waffles I bought at Trader Joe's. I seldom eat sweets and this including sweet dishes. I saw the Belgian waffles in Trader Joe's flyer that came in my mail one day. What piqued my interest was it is made in Belgian. I decided to pick one up while shopping in the store. I arrived to Costco when it just open. I can do the shopping quickly and avoid the late saturday morning traffic returning home too. A surprise fine at Costco are these Italian crystal wine glasses - 8 for $24 works out to be only $3 dollars each. I have been wanting some crystal wine glasses a long time but had been unwilling to pay $10 or more each. Today I set out to change the engine oil and air filter on Brunnhilde. Recently Napa Automotive Supply has Mobil 1 synthetic oil on sale for $5.98 a quart. This is about $0.50 cheaper than the lowest retail price. I stocked up 24 quarts enough for more than 2 oil changes. Brunnhilde has engine oil capacity of 10 quarts (with filter change). My existing oil catcher pan is way too small so I bought this big one at Walmart. While it is not ideal, at ~$8.90 it is less than other automotive supply stores charge.